Michael Schumacher has been showing “small, encouraging signs” in his fight for recovery, the Formula 1 champion’s family says. “We are and remain confident that Michael will pull through and will wake up,” the relatives said in a statement. Doctors in France have been working to bring the seven-time champion out of a medically induced coma. 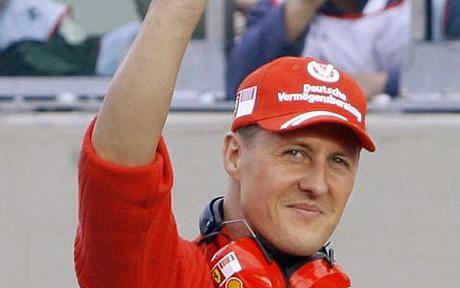 Michael Schumacher, 45, suffered a severe head injury in a skiing accident in the French Alps on 29 December. He has been kept in a coma to help reduce the swelling in his brain. On Wednesday, Michael Schumacher’s manager, Sabine Kehm, released a statement on behalf of his family because of “an increasing interest in [his] condition in light of the start of the Formula 1 season”. The family praised the efforts of the French doctors at Grenoble hospital, but also warned this was “a time to be very patient”. “It was clear from the start that this will be a long and hard fight for Michael,” the statement read. Investigators probing the accident said Michael Schumacher had been going at the speed of “a very good skier” at the time of his crash in the resort of Meribel. Experts reconstructed events leading up to the crash after examining Michael Schumacher’s skiing equipment and viewing footage filmed on a camera attached to his helmet. Michael Schumacher retired from racing in 2012 after a 19-year career.